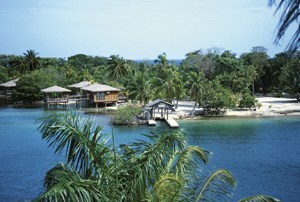 Anthony’s Key Resort, located on the Bay Island of Roatan, Honduras, beckons all who dream to escape from it all. Experience the romance of a Caribbean paradise, soaking in the sun on soft white beaches amid sparkling turquoise waters. Guests are accommodated via individual natural wood bungalows suspended on stilts and scattered across a palm–studded private islet or a lush green hillside. Adding to the mystique are playful dolphins, whose home is the Roatan Institute for Marine Sciences on the hotel property. Visitors can snorkel or dive with these fascinating, friendly animals. The Dolphin Summer Scuba Camp is offered for children between the ages of 5–14. This program presents the perfect opportunity for parents to bring their children on vacation, and still have time for themselves. The children get to spend a week with the dolphins and learn snorkeling and scuba techniques and to appreciate the sea and its wonderful life. World–class scuba diving or snorkeling on the world’s second largest barrier reef leaves guests breathless. The variety of marine life, exotic coral, sponges, tunnels, caves, sand chutes, walls and bright tropical fish fuels a lively debate over which scenery is more beautiful, that above or below sea level. Rates include day excursion to Maya key, airport transfers, kayaking, hiking, the Roatan museum and three delicious meals per day. Weekly packages offer the best value in the Caribbean. Discover the charming hospitality that has kept guests returning for over 40 years. Call for the best Value Dive package in the Caribbean.